How do I grade Course Assignments? 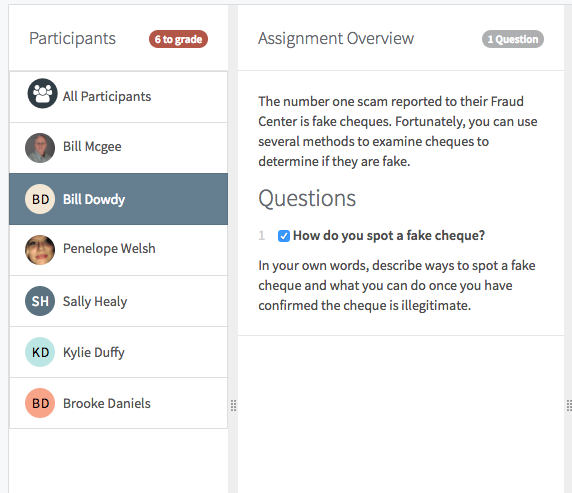 If you have the Grade permission on a Group of Participants, then you will have the ability to grade the Assignments for those Participants. To grade an assignment, simply click on the Grade button at the top of the screen. You will now be presented with a list of Assignments that you can grade. If the list is empty, this means you don't have the correct permissions for grading and will need to contact your administrator. 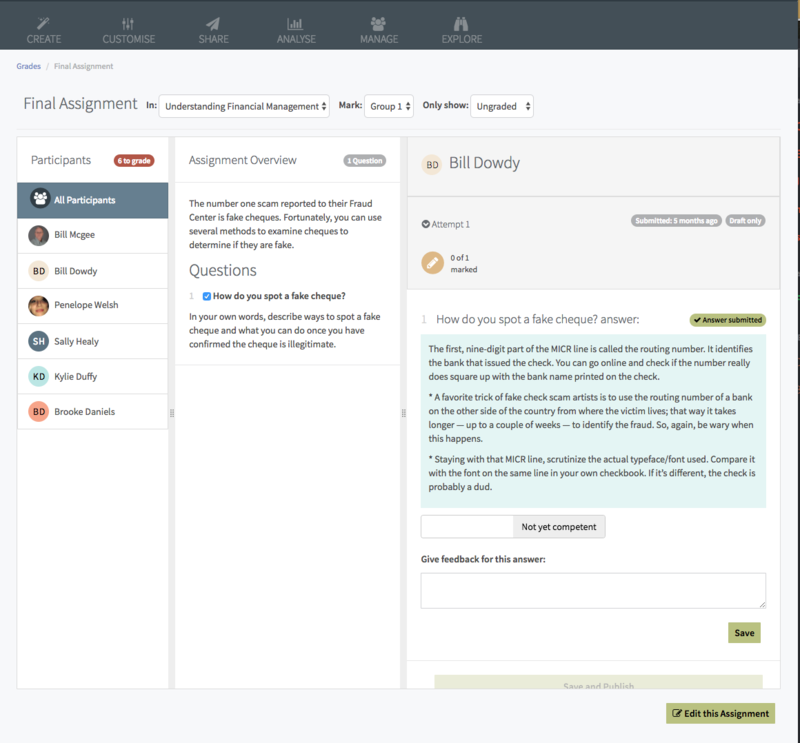 The Grade screen allows Course Facilitators to grade multiple responses to the same Question from one screen, and/or multiple Assignments from the same Group. As an Assignment can belong to a number of Courses and groups, and the selectors across allow you to choose what Course and from what Group you want to mark. By default, the 'Ungraded' selector is chosen to show only the Participants who have not yet been graded. After you've selected the Course and Group you want to grade, you can select the Participants you'd like to grade first. You can select All Participants, a few, or just one. You can also choose to grade a single question or multiple questions at once. 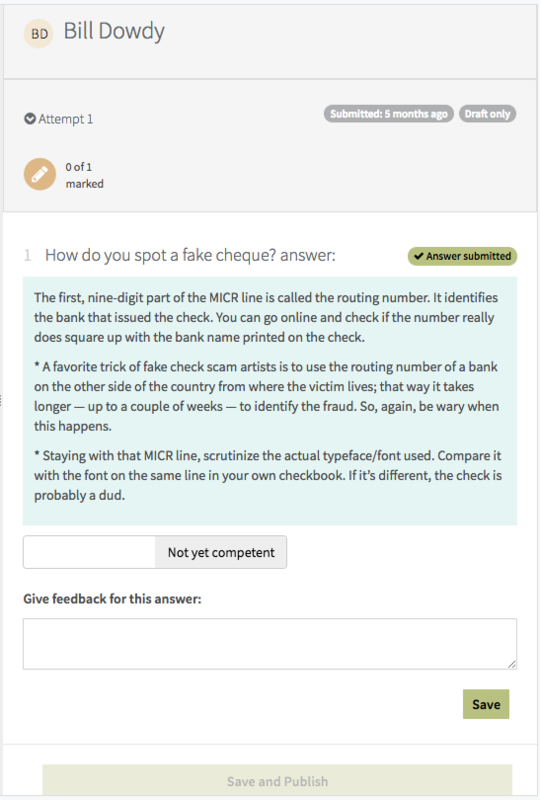 Just check the checkboxes next to each question you would like to mark. To Mark the question, go to the far right panel to review the Participants responses. Depending on your grading scheme, you can either mark the Participant as competent or give them a grade mark. You can also provide feedback for the student on each individual question. Click Save to mark the question. Clicking Save, only saves the mark to the system, it does not display this mark to the Participants until you've clicked the Save and Publish button. This allows you to mark multiple Participants at once, and adjust your marks if required before making them public. In addition to providing Participants with feedback per questions, you can also upload an overall feedback document. Click the Save and Publish button when you're happy with the grades you've given. The grades will now be available for your Participant to review.